LolliX® Xylitol Lollipop Strawberry by XYLIPUR®. Optimized for children. LolliX® lollipops are also suitable for the care of adult teeth. Delicious strawberry flavor. 6 pieces in the bag. 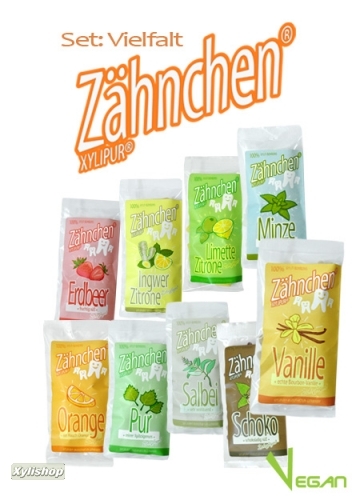 The new generation of lollipops in Germany is made from 100% premium xylitol and natural strawberry flavor. Enamel-damaging substances, dyes, sugar substitutes such as isomalt, sorbitol or mannitol or artificial sweeteners such as aspertame are not included. Vegan. Xylit Schokotropfen zartbitter. 300g für puren, dunklen Schoko-Knabbergenuss. Diese Schokotropfen bestehen aus 72% bestem Kakao und sind allein mit Xylit gesüsst: Ideal auch zum Verzieren und Backen.